Girsan is a Turkish manufacturer of firearms that has been in business for some seventeen years. Primarily in the 9mm and .45 ACP autoloading pistol market, the new MC 312 is apparently their first venture into shotguns. There are several configurations of the MC312 that have been released, all based on the Bruno Civolani (inertia) action. In the United States, they are being sold exclusively by Bud's gun shop as far as I know. Following are the basic specifications common across the line. I'm taking a look at two models, the 26 inch walnut model (above) and a 26 inch barrel Mossy Oak Break-Up camo model. The MC312 shotguns sell in the $599-$699 price range, a very competitive price point for autoloading shotguns. The walnut version weighs seven pounds on the nose, while the camo version weighs in at seven pounds, two ounces. I found the trigger of the walnut version to be excessively heavy with about 7 lb. break, right at the weight of the entire gun, but the camo version was far more manageable with a 5-1/2 pound trigger as supplied. Both guns come better presented than many, with a good plastic hard case and a full complement of five Mobilchokes. Both guns have red tubular front beads and both are finished off with fairly stiff durometer recoil pads, though the camo guns recoil pad is more generous. The camo dip is extremely well-applied, and the walnut is a far better than average grade: both guns were surprisingly well finished for guns at this price point. Years ago, when the John Browning patents expired, there was a rush of shotguns released using the superlative, long-recoil action. Much the same happened with variations of the Beretta 300 series of gas autoloaders, and now you can expect the same with the Civolani / Benelli action as we see here. The testing was done primarily with 1230 fps 1-1/8 oz. B & P Legend shotshells. Both firearms functioned without any failures to feed or failures to eject. However, the Mossy Oak Camo model was far, far more comfortable to shoot. The basis is the far superior recoil pad on the synthetic gun as compared to the walnut model, as the 2 oz. of additional weight on the Camo model is insignificant and could not account for the far more pleasant shooting of the Camo model by itself. Though normally I'm inclined to favor walnut and blued steel, the softer shooting of the Mossy Oak Camo model combined with the better trigger (perhaps just the luck of the draw) makes the MC312 Mossy Oak the more desirable of these two guns. The walnut model would require touching up the trigger and an aftermarket recoil pad to be as enjoyable, at least as far as I'm concerned. In the economical inertia gun market, these Girsan models fare quite well, a big jump up in build quality compared to the Stoeger branded offerings, for example. As compared to the somewhat pricier yet still affordable Franchi Affinity 12 gauge, it is a closer call. The Franchi's are a bit more money, have better triggers, include adjustment shims, and have a far better warranty. Yet, the Girsan MC312 have recoil pads more easily replaced than the notched layout of the Franchi buttstocks. The MC312s also have slimmer forearms, as the mainspring is in the buttstock not in front of the receiver beneath the forearm. The Girsan MC312s strike me as being very well machined, with better build quality than expected. A step up not only from Stoeger, but also the CZ-USA marketed Huglo autoloaders. The primary point of consternation here is the weak warranty of just one year. Not only that, but the manual instructs you to include a money order for the exact amount of return shipping to you if you need to ship the gun to Guns, Inc., for service. Not only that, but the supplied instructions threaten to void your warranty if the warranty card is not mailed out within 30 days. None of this is confidence-inspiring, for if you have a defective gun you shouldn't have to pay any return shipping and threatening to void a one year warranty for lack of returning a warranty card makes no sense. 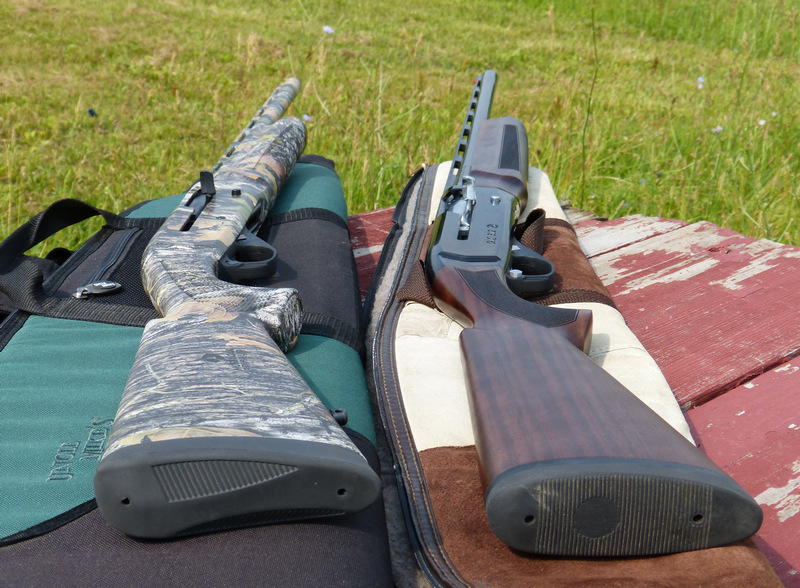 Stoeger offers a 5 year warranty, Franchi a 7 year warranty, CZ-USA a 5 year warranty. For Girsan to establish itself as a new brand, in my opinion they are going to have to beef up their warranty policy to a competitive level and lose the send us a money order for return shipping nonsense. As far as the guns themselves, though, they appear very well built, with nice attention paid to the receiver and forearm profiling, good hard cases, a generous number of included chokes, and well-machined parts particularly the very well done barrel extensions. Both guns tested are functional and apparently perfectly reliable, with the edge going to the softer-shooting Mossy Oak synthetic version. The guns themselves are very competitive, better than most in their price class with the anemic warranty the sole area of legitimate concern in my opinion. The Girsan MC312 shotguns are available through Bud's Gun Shop, who you can contact for more information at http://www.budsgunshop.com/catalog/index.php or by phone at 859-368-0371. I will note that Bud's Gun Shop, on their website, has a brief skybox that states: "All GIRSAN firearms are 100% guaranteed by Buds ! If you have ANY problems with a GIRSAN, Bud's will provide your choice of... 1. Full Refund 2. New Replacement 3. Warranty Repair." However, no paperwork that shipped with the tested guns tested indicates this, there is no mention of length of the warranty, or any other specific details. After publication of this review, I was advised by the officials at Girsan that the MC312 warranty was in the process of being updated to five years from date of purchase.